The original Google Pixel had somewhat divisive looks, but if recent leaks are anything to go by, the second version will appeal much more to the masses. Now a render based on those leaks gives us a good idea of just how sleek it might be. YouTube Channel Concept Creator took a stab at creating 3D models of the device, including some possible shades and two-tone color configurations. While there’s nothing to suggest Google will use these specific colorings, chances are there will at least be one or two vibrant options. The iPhone 8 may end up having the smallest bezels, but Google definitely has it beat on the backside. 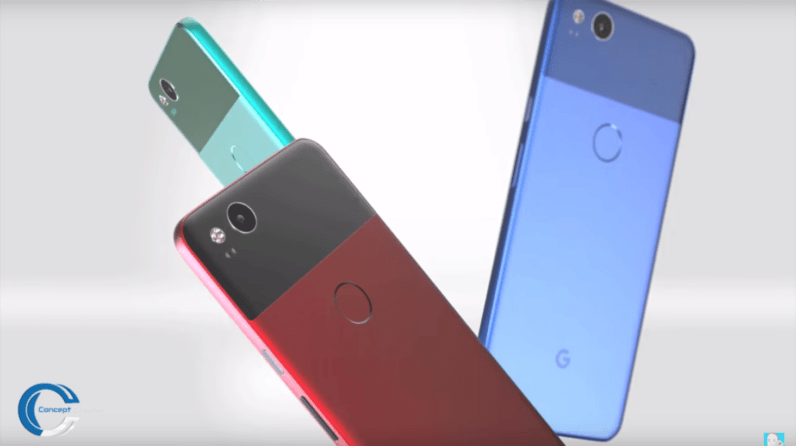 It’s a sleek evolution of the Pixel’s most notable design elements – the glass ‘window’ on the back, most notably – while making it a bit more attractive for the masses. That said, keep in mind this is just for the Pixel XL 2. Current rumors suggest the smaller model won’t use the same miniscule bezels, which means the front probably won’t look as sleek or have any extra real estate. Still, if Google mixes it up with some two-tone shades, I might have to pick one up anyway.